As a child, the story about the Tower of Babel fascinated me. I honestly believed that the people were capable of building a tower that would reach into heaven, where God “lived”, and it was interesting to think what they might find there. I felt disappointed and even somewhat annoyed that God mixed up their language and they could no longer work on the tower. Needless to say, my understanding of the this story was… let’s just say inaccurate. Not only was it inaccurate, but it led me to have a false understanding of an omnipotent God and His plan for mankind. 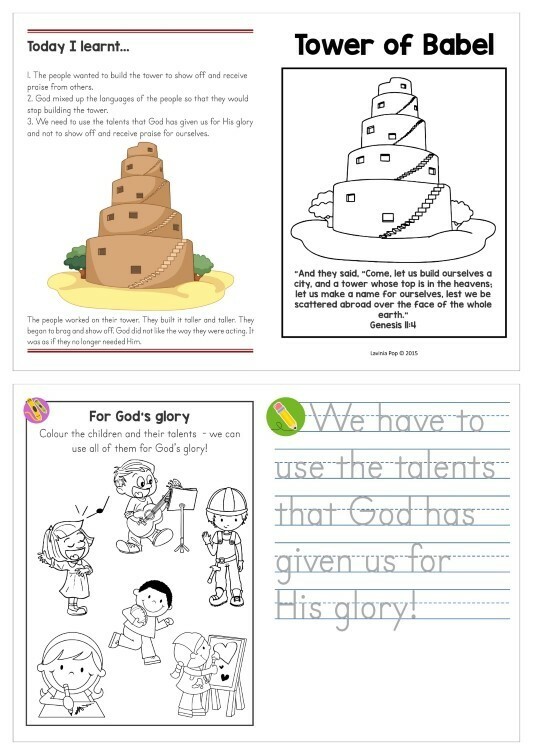 It was my mission, as I prepared the lesson plan for our little ones, to ensure that they did not have the same misunderstandings of the event, nor about God. I used some Duplo blocks and Lego people to act out the story. We started where we had left off the previous week – Noah, his family and all the animals had just gotten off the ark and God told them to have many children and spread out over all the earth. And so, they had many children, just as God had told them. However, they didn’t listen to the last bit of God’s commandment to spread out over all the earth, and they stayed together and traveled to a place called Shinar, where they decided to live. While in Shinar, they decided to build a great tower that would reach all the way into the sky so that they could show off how smart they were. They didn’t want to give God glory like Noah did after he came out of the ark. They wanted to show off how smart they were and get the glory for themselves. God saw that the hearts of the people building the tower were full of bad thoughts and that they were forgetting about God. God wanted them to stop building the tower and remember Him. Now, God is all-powerful and He could have knocked down their tower to stop them building it and to punish them for not listening to His commandment to spread over all the earth. However, God is much wiser than us and He didn’t destroy their tower; instead, He mixed up their languages! Now, the people had no choice but to stop building the tower. The people who spoke the same language grouped up and they all spread out in different directions, which is what God had originally asked them to do. After we finished telling the story, we spoke about how God is the One who gives us knowledge and talents and that He wants us to use them for His glory and not to show off. And that was our brief lesson on the Tower of Babel where the kiddos learnt that the reason God mixed up the people’s language was because they didn’t listen to His commandment to spread out over all the earth and also because He wanted to put an end to their arrogance. Here’s the craft we did. We also gave out kiddos a take-home page.